Stress signaling in cells are partly mediated through c-Jun N-terminal kinase (JNK) and p38 mitogen-activated protein kinase (MAPK). A kinase upstream of these stress-mediated pathways is apoptosis signal-regulating kinase 1 (ASK1). ASK1 is a serine/threonine kinase that belongs to the family of mitogen-activated protein kinase kinase kinase (MAP3K). It is endogenously expressed in various cells. Various stress signaling activates ASK1 including reactive oxygen species (ROS), tumor necrosis factor alpha (TNFa), lipopolysaccharide (LPS) and endoplasmic reticulum (ER) stress. These events ultimately lead to the activation of JNK and p38 MAPK. As a result, ASK1-MAPK signaling is associated with various cellular stress responses including apoptosis, differentiation, and inflammation. 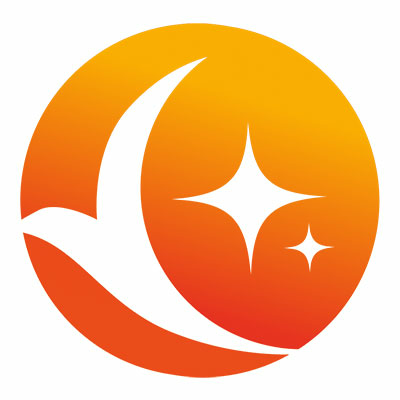 Several studies show that aberrant ASK1 signaling leads to severe human diseases such as neurodegenerative diseases, induction of inflammatory diseases and cancer. 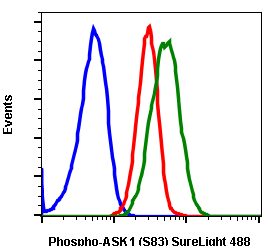 The phosphorylation of the threonine residues 838 (Thr838) in human and Thr845 in mice is important for ASK1 activation. At basal inactive state, ASK1 is a homooligomer, which binds to another ASK1 via its C-terminal coiled-coil domain. The N-terminal coiled-coil of ASK1 binds to thioredoxin (Trx), which suppresses ASK1 kinase activity. Under oxidative stress, oxidized Trx is separated from ASK1 and unbond ASK1 is activated by phosphorylation. 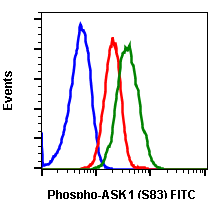 Calcium influx and oxidative stress can elicit phosphorylation of the ASK1. After H2O2 injury, tumor necrosis factor 2, (TRAF2) and TRAF6 act as positive regulator of ASK1. 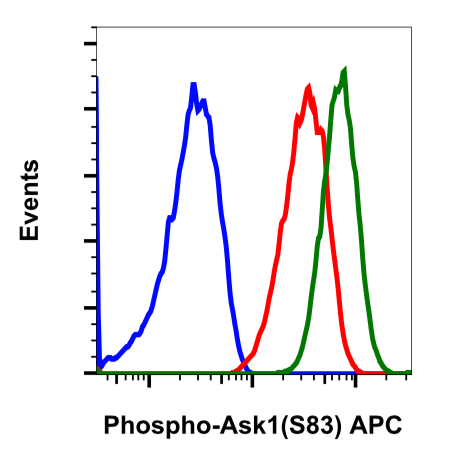 14-3-3 proteins, act as negative regulator of ASK1 by binding to the C-terminal of ASK1 after Ser966 phosphorylation. However oxidative stress promotes dephosphorylation of Ser966 and lead to detachment of 14-3-3. TNF and Fas death receptor activate ASK1. ASK1 is an early signal stress responder to oxidative stress in cerebral ischemia. ASK1 has also been implicated in thrombosis, brain edema, inflammatory response, and reactive gliosis. Predicted to work with mouse, rat and other homologues. 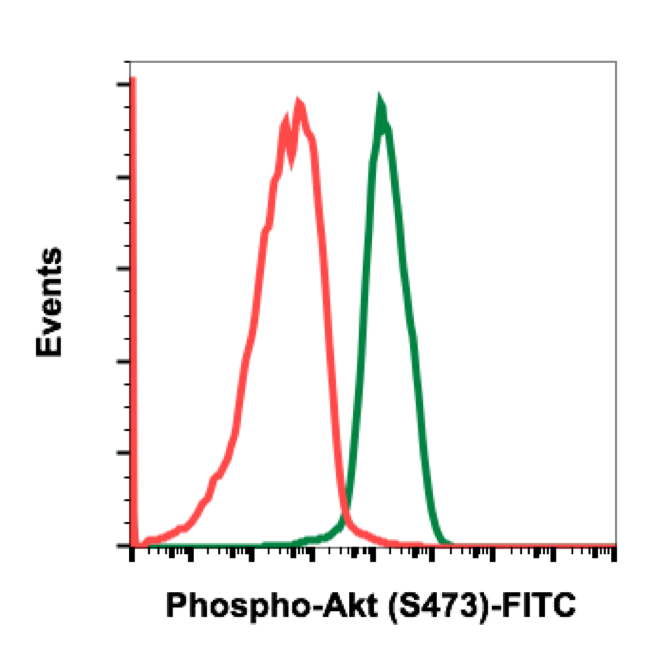 For flow cytometric staining, the suggested use of this reagent is 5 µL per million cells or 5 µL per 100 µL of staining volume. It is recommended that the reagent be titrated for optimal performance for each application. Matsukawa J, et al., (2004) J Biochem 136: 261-265. Shizaka S., et al., 2013, Adv Biol Reg 53: 135-144. Sekine Y., et al., (2006), Curr Mol Medicine, 6: 87-89. Matsuzawa A., et al., (2002) Antioxidants Redox Signal 4:415-425. Nagai H., el al., (2007), BMB report, 40:1-6. Kulkarni S., et al., (2000), J Clin Invest 112:3555-3562. 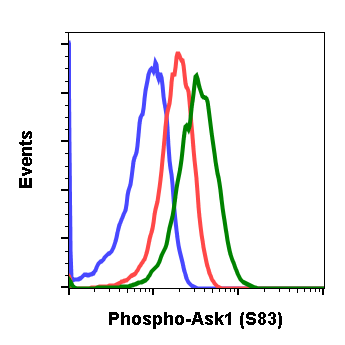 Flow cytometric analysis of HT1080 cells secondary antibody only negative control (blue) or treated with imatinib (red) or with pervanadate (green) using Phospho-Ask1 (Ser83) FITC-conjugated antibody Ask1S83-G4. Cat. #2098.